…with a brand new name. I decided to change the name at the end of last year, after stumbling across a blog with a similar name with teaching/school content. It was a little used blog but it still made me uncomfortable. I did a lot of research before choosing the original name to ensure that I wouldn’t be copying any aspect of an existing blog. It’s possible that the blog didn’t show up in my original searches because it hadn’t been used in so long. Anyway, it made me uncomfortable and I wasn’t super excited about the name either. So after a couple of weeks, a few of what must have been seriously annoying conversations with family and friends, and many pages of scribbles, I finally landed on a name. I did a lot of research and found nothing with the same title, no blogs and no websites. Yay! I immediately loved the idea of using More Like Guidelines. There are several reasons that it appealed to me so much, first is probably the most obvious, the Pirates of the Caribbean movie was so good and the quote “The Code is more like guidelines rather than actual rules” was just too funny and perfect. For me personally, using More Like Guidelines was really fitting, because I seem to lack the ability to follow a pattern or instructions* to the letter. I am constantly modifying and tweaking different aspects of a project to make it fit what I want. So, to me patterns and instructions are really more like guidelines. It’s been a while since I posted and I’ve been busy with several projects so I’ve got more than enough ideas to share. 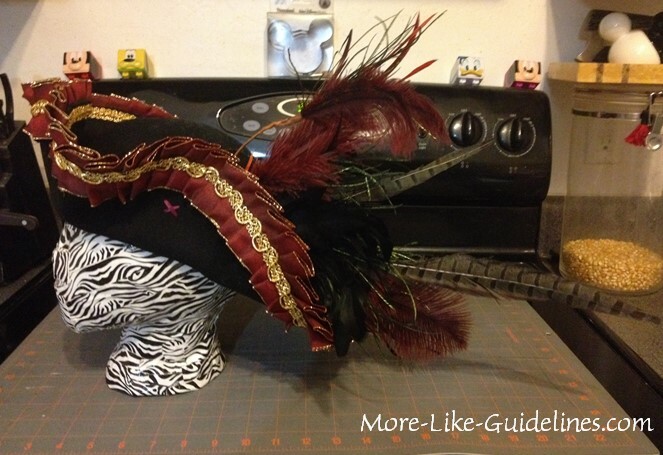 For now, I’ll leave you with the Pirate hat that I created for Scarlet. I’ll be talking about this soon in future Costume Corner posts. *When I say instructions here I mean creative/arts & crafts instructions. When it comes to tools, machinery, etc., I follow instructions to the letter. Safety always comes first.